Placing my new chair where I wanted it in the great room, I couldn't help but notice that if swiveled to the left, I could use the Pres' footstool. 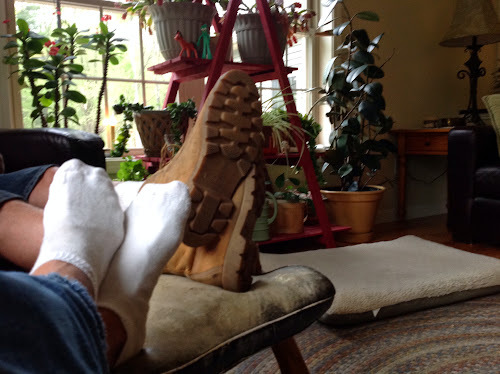 Placing my tootsies up their one afternoon, he, the man who rarely speaks, said, "so now we get to play footsies????" His footrest came from Turkey when he was in the Navy. For future reference...a camel saddle makes a great footstool!!! no footsy playing for us, bob never wheres shoes, only when he goes in a store.. he even drive barefoot. his feet are even rougher than the bottom of those boots.. they rip sheets and blankets. I think I've heard that question before. :) Nice footstool! It is a camel saddle from Turkey? So cool, and I bet it is the center of attention when visitors come. Footsies count me in :O). Playing footsie with your guy is a good thing :O). Sorry to hear your book hasn't arrived yet. It's had about 10 days now...... I hope it's not lost in the post! Does nudging hubby to stop him snoring count?